Host your big day here. Want an ultra-glamorous affair with all the embellishments? Prefer to exchange your "I dos" in a casual beach setting? Either way, our award-winning wedding venues offer an unforgettable experience that's tailored to you. We go beyond the ceremony and reception, helping you plan from rehearsal dinner to honeymoon. Elevate the occasion with activities like a spa day, round of golf, or a bachelor's suite. 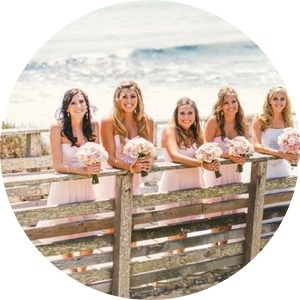 You'll find we're the perfect pick for a Coastal California wedding weekend. Let us help you add coastal touches to your big day. Our spaces are as flexible as they are inviting, and can accommodate everything from elopements all the way to weddings for 320 people. We tailor each venue to fit your ideal day—whether we're hosting your rehearsal, ceremony, reception or all of the above. Exchange your vows against a serene backdrop of ocean waves. Our ceremony site offers an unforgettable ambiance that will captivate your guests and translate into incredible wedding photos. After your ceremony and prior to your reception in the Grand Ballroom, a champagne celebration will be held on our beautiful Waterfall Terrace. Guests can mingle in a relaxed setting while the newlyweds take photos on the beach. This venue coupled with a naturally lit foyer features nearly 30,000 square feet of coastal elegance for your reception. It is a classic choice with romantic lighting to keep your party dancing the night away while being served by the Central Coast's finest event team. Our ballroom space can be customized to suit your style and vision to create the event of your dreams. This outdoor venue treats attendees to breathtaking sunset views of the Pacific. Our tents are custom-ordered with beautifully draped ceilings and French doors. The tent experience allows you to maximize our oceanfront location, lending endless seascape views to your ceremony, champagne reception, dinner and dancing. We'll work with you to make sure your walk down the aisle is just the way you've always imagined it. After your ceremony, we'll help create the reception to match with customizable packages suited to you, your tastes and your budget. This package includes all the embellishments you’d expect at a coastal wedding, but keeps the flexibility to style your big day your way. The Cliffs has the perfect all-inclusive packages for those looking to have the ultimate Coastal Destination Wedding Reception. These quintessential packages are designed for celebrating your marriage with the best the Central Coast has to offer with your family and friends. At The Cliffs, we offer beautiful weddings year round. If you select to have your wedding during the months of November – April, we include the following upgrades to make your wedding a little grander, just like the winter waves in Shell Beach. This package may not be combined with the Sunday Splendor Package. Valid for weddings of 75+ guests. Excludes select Holiday and Special Event Weekends. At The Cliffs, when you select a Sunday wedding ceremony and reception, we would like to enhance the splendor of your day with the following Sunday Upgrades. This All-Inclusive package creates a sophisticated and stylish evening for the wedding you’ve always dreamed of. This All-Inclusive package is for a classic beach wedding that will wow your family and friends. For all of the details, pricing and additional information about all of our wedding packages download our wedding brochure. Monday – Thursday: Your Wedding may be reserved up to one year in advance. Sunday & Friday: Your wedding may be reserved up to 3 months in advance. Saturdays: Morning Weddings occurring prior to Twelve in the Afternoon may be reserved up to three months in advance. Saturdays: Afternoons & Evenings may be reserved up to two months in advance. Minimum of 2 Weeks’ Notice Required for all dates. A quick walk to the beach brings you to the sparkling blue ocean and the sound of rolling waves, creating a stunning setting for wedding photos. Before your big day, pamper yourself and your wedding party at our full-service spa offering rejuvenating services ranging from one-hour treatments to full-day experiences that soothe away stress. Your guests will love our signature eatery, featuring fresh fare, craft beers and local wines. Whether you’re looking to host a rehearsal dinner, farewell brunch or a romantic dinner for two, it’s the perfect place to savor the moment.